This article is about the space vehicle used in Star Wars. For the 2008 novel, see Millennium Falcon (novel). The Millennium Falcon is a fictional starship in the Star Wars franchise. The modified YT-1300 Corellian light freighter is primarily commanded by Corellian smuggler Han Solo (Harrison Ford) and his Wookiee first mate, Chewbacca (Peter Mayhew). Designed by the Corellian Engineering Corporation (CEC), the highly modified YT-1300 is durable and modular, and is stated as being the second-fastest vessel in the Star Wars canon. The Millennium Falcon first appears in Star Wars (1977), and subsequently in The Star Wars Holiday Special (1978), The Empire Strikes Back (1980), Return of the Jedi (1983), Revenge of the Sith (2005), The Force Awakens (2015), The Last Jedi (2017), and Solo: A Star Wars Story (2018). Additionally, the Falcon appears in a variety of Star Wars expanded universe materials, including books, comics, and games; James Luceno's novel Millennium Falcon focuses on the titular ship. It also appears in the 2014 animated film The Lego Movie in Lego form, with Billy Dee Williams and Anthony Daniels reprising their roles of Lando Calrissian and C-3PO, and Keith Ferguson voicing Han Solo. The ship originally had a more elongated appearance, but this design's similarity to the Eagle Transporters in Space: 1999 prompted Lucas to change the Falcon's design. The original model was modified, re-scaled, and used as Princess Leia's ship, Tantive IV. Modelmaker Joe Johnston had about four weeks to redesign the Falcon, and Lucas's only suggestion to Johnston was to "think of a flying saucer". Johnston did not want to produce a "basic flying saucer", so he created the offset cockpit, forward cargo mandibles, and rear slot for the engines. The design was simple enough to create in the four-week window. Johnston called production of the new Falcon design one of his most intense projects. The sound of the ship traveling through hyperspace comes from two tracks of the engine noise of a McDonnell Douglas DC-9, with one track slightly out of synchronization with the other to introduce a phasing effect. To this, sound designer Ben Burtt added the hum of the cooling fans on the motion-control rig at Industrial Light & Magic (ILM). The effects models for Star Wars matched the design of the exterior set. The primary model was 5 feet long and detailed with various kit parts. The ship was represented by a matte painting when Princess Leia (Carrie Fisher) sees it for the first time, showing the full upper surface. For the 1997 "Special Edition", a digital model replaces the effects model in several shots, and is used in a new shot of the Falcon lifting off from Docking Bay 94. For The Empire Strikes Back, a new external set was constructed. In spring 1979, Marcon Fabrications, a heavy engineering firm that served the UK's petrochemical and oil industries, was hired to build a movable full-scale external model capable of "moving as if it were about to take off." Built in secrecy under the project code name Magic Roundabout, the company leased the 1930s Western Sunderland Flying Boat hangar in Pembroke Dock, West Wales. The model, which took three months to construct, weighed over 25 long tons (25 t), measured 65 feet (20 m) in diameter and 20 feet (6.1 m) high, and used compressed air hover pads for up to 1.5 inches (38 mm) of hover-height movement around the set. It was then disassembled and shipped to Elstree Studios, Hertfordshire, for filming. Today, the Pembroke Dock museum has an exhibit about the project. Along with the full-size mock-up of the Falcon, a new miniature model was created for Star Wars: Episode V - The Empire Strikes Back to allow ILM to film more intricate in-flight rolls and pitches that were not possible with the five-foot model. This model was able to be mounted on a gimbal that allowed ILM to simulate very difficult maneuvers as the ship attempted to outrun Imperial TIE fighters during the asteroid-field-escape scene from the film. The new model, which measured at approximately 32 inches in length, had several surface features that differed from the five-foot model including updated landing gear and different surface greeblies. The 32" model was the version of the Millennium Falcon most depicted in toys, model kits, and promotional materials for the Star Wars universe prior to the release of The Force Awakens. The model was reused for Star Wars, Episode VI: Return of the Jedi. As in Star Wars, the location set was changed around the ship set. The only major design change was to add landing gear where the disguised fuel line had been in Star Wars. As this set included the port side, that gave the set seven landing gears. The internal set was slightly refitted from A New Hope and featured a sliding cockpit door, a larger cargo hold, an additional corridor to port, and an equipment room. Two new interior sets were created that are not shown to connect to the rest of the set: a top hatch that Lando Calrissian (Billy Dee Williams) uses to rescue Luke Skywalker (Mark Hamill), and the compartment where Luke rests on a bunk. 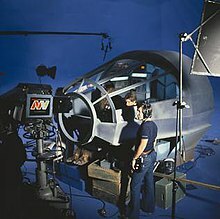 The 5-foot-long (1.5 m) effects model from Star Wars was modified to reflect the additional landing gear, and several new models were built, including one roughly the size of a U.S. Quarter Dollar. For the 1997 Special Edition, a CGI model replaced the effects model during the approach and landing on Cloud City. A digital version of the Falcon appears briefly on Coruscant in Revenge of the Sith. Lucas has said that the ship is the Falcon and not another ship of similar design. A CGI version of the vessel also appears in the Disney attraction Star Tours: The Adventures Continue. On June 3, 2014, TMZ confirmed that the Falcon would return for Star Wars: The Force Awakens when it leaked a photo from the set of the film, showing a full-scale version of the Falcon being built. An effects shot of the Falcon appears in the teaser trailer for The Force Awakens, released on November 28, 2014. This version of the ship is a digital recreation of the original 1977 5 foot model, with additional detailing reflecting the passage of time. The most noticeable change is the rectangular sensor array above the top hull, which replaces the circular dish from the first three films. Han Solo won the Millennium Falcon from Lando Calrissian in the card game 'sabacc' several years before the events of the film A New Hope. In Star Wars, Obi-Wan Kenobi (Alec Guinness) and Luke Skywalker (Mark Hamill) charter the ship in the Mos Eisley cantina to deliver them, C-3PO (Anthony Daniels), R2-D2 (Kenny Baker), and the stolen Death Star plans to Alderaan. When the Falcon is captured by the Death Star, the group conceal themselves in smuggling compartments built into the floor to avoid detection during a search of the ship. Solo later collects his fee for delivering them to the hidden Rebel base and departs under bitter circumstances, but returns to assist Luke in destroying the Death Star. Solo pilots the Falcon, with Chewbacca, Leia, and C-3PO aboard, to elude the Imperial Starfleet in The Empire Strikes Back, wherein they take refuge at Cloud City, where Darth Vader (David Prowse/James Earl Jones) captures Solo. Lando Calrissian helps the others escape and, at the film's end, he departs in the Falcon to track down Solo and his captor, Jabba the Hutt. Calrissian again captains the Falcon during the climax of Return of the Jedi, with Nien Nunb as co-pilot, to destroy the second Death Star. Before the second Death Star is destroyed, Lando accidentally damages the ship by hitting the circular sensor rectenna dish on a random pipe or circuit in the second Death Star. Lando and the others still have success in destroying the Galactic Empire. In Star Wars: The Force Awakens, set some 30 years after Return of the Jedi, the Falcon is in the possession of a scrap dealer named Unkar Plutt on the desert planet Jakku, having been stolen from Solo and Chewbacca some years prior. Scavenger Rey (Daisy Ridley) and former stormtrooper Finn (John Boyega) steal the Falcon in order to escape from an attack by the First Order, having been targeted for having the droid BB-8 in their possession. During the chase sequence, the Falcon demonstrated an atmospheric performance of 60 degree turn rate per second, and a 90 degree roll rate per second. They are captured by a smuggling freighter, which turns out to be piloted by Solo and Chewbacca, who reclaim the Falcon for their own. Forced to escape in the Falcon from an ambush by parties to whom Solo is heavily in debt, Solo reluctantly agrees to help Rey and Finn return BB-8 to the Resistance. After Rey is captured by the First Order, Solo agrees to take Finn in the Falcon to the First Order's new Starkiller Base—a planet that has been converted into the next generation of 'Death Star'—by attempting a risky maneuver of bypassing the planet's defences by exiting hyperspace in its atmosphere. When Solo is killed by his son, Ben Solo—now known as Kylo Ren—Rey essentially inherits the Falcon, escaping the destroyed Starkiller Base with the injured Finn and Chewbacca. Later, Rey uses a newly-assembled map to travel to Ahch-To, the site of the first Jedi temple, to make contact with the long-lost Luke Skywalker, travelling in the Falcon in the company of Chewbacca and R2-D2. The Falcon appears again in Star Wars: The Last Jedi, still on Ahch-To with Rey and Chewbacca. Later in the film, Chewbacca and Rey take the Falcon to the planet Crait, where the Resistance is under attack by the First Order. The Falcon loses its sensor dish for the third time on Crait, after it is shot off by a TIE fighter, but still manages to single-handedly take out most of the First Order's fighters on the planet while Luke distracts Kylo Ren. After the battle, surviving Resistance personnel leave Crait aboard the Falcon. In The Last Jedi, Rey uses the Falcon's escape pod to board Supreme Leader Snoke's ship. Director Rian Johnson noted that he wanted its design to resemble a coffin, inspired by C. S. Lewis' Perelandra. The escape pod was monogrammed to say "Property of Han Solo". In the film Solo: A Star Wars Story, it is revealed that Lando modified the Falcon by putting an escape pod between the frontal 'mandibles', which Han jettisons to escape a gravity well. In the initial film, Solo brags that the Falcon made the Kessel Run in "less than twelve parsecs". [a] As the parsec is a unit of distance, not time, different explanations have been provided. In the fourth draft of the script, Kenobi "reacts to Solo's stupid attempt to impress them with obvious misinformation." Lucas acknowledged the misnomer in 1977, saying that Han modified "the navigational system to get through hyperspace in the shortest possible distance". On the film's DVD audio commentary, Lucas further explained that in the Star Wars universe, traveling through hyperspace requires careful navigation to avoid stars, planets, asteroids, and other obstacles, and that because no long-distance journey can be made in a straight line, the "fastest" ship is the one that can plot the "most direct course", thereby traveling the least distance. In Solo: A Star Wars Story, Solo's Kessel Run is depicted in detail, providing an explanation for the "twelve parsec" boast. Solo has to make many calculated jumps to avoid killing the crew. After integrating the memory module of Lando's damaged L3 droid into the ship's navigation, Solo is able to take a "shortcut" (which is dangerously close to a black hole). Chewbacca indicates the real distance was closer to 13 parsecs, but Solo insists, "Not if you round down," implying that the claim of "less than twelve parsecs" is slightly exaggerated. The Falcon has been depicted many times in the franchise, and its ownership and command have changed several times. Prior to Star Wars, the Falcon was in the possession of Lando Calrissian. He lost it to Han Solo in payment of a gambling debt. This is depicted in Solo: A Star Wars Story, as well as the integration of Lando's droid L3-37 to the ship's computer. After the events of The Empire Strikes Back, Leia, Chewbacca and Lando take possession of the Falcon after Solo's hibernation in carbonite and capture by the Empire and Boba Fett. During Return of the Jedi, Solo leaves Tatooine aboard the Millennium Falcon, and on arrival at the rendezvous for the Rebel fleet he loans the Falcon to Calrissian, who pilots it during the Battle of Endor and the destruction of the second Death Star. After the events of Return of the Jedi, the Falcon is stolen from Solo, ending up on the planet Jakku under the ownership of a scrap dealer, Unkar Plutt, 30 years after the Battle of Endor. In The Force Awakens, Rey and Finn commandeer the ship to escape the planet, only to be found by Solo and Chewbacca, who immediately reclaim the ship. After the death of Solo, Rey pilots the Falcon, with Chewbacca as her co-pilot. The novelization of The Force Awakens states that Chewbacca willingly abdicates captaincy of the Falcon to Rey. After the events of The Last Jedi, the ship becomes the base of operations for the remaining members of the Resistance. Joss Whedon credits the Millennium Falcon as one of his two primary inspirations for his Firefly television show. The Falcon and the Falcon's distinct shape appear in Star Trek: First Contact, Blade Runner, Spaceballs, and Starship Troopers. The manga series Berserk includes a Millennium Falcon arc. In another manga and anime series, Hellsing, the Millennium Falcon is referenced briefly for comedic effect. The adult animation sketch-comedy series Robot Chicken aired a sketch entitled "The Emperor's Phone Call," in which Palpatine receives the news of the destruction of the Death Star with incredulity, at one point angrily asking "What the hell is an aluminum falcon?" In 2010, Adidas also released a pair of Stan Smith trainers inspired by the Millennium Falcon, as part of the Adidas Originals Star Wars campaign. SpaceX states that its Falcon family of rockets is named after the Millennium Falcon. In 2015, scale model manufacturer DeAgostini and Model-Space introduced a monthly installment piece-build model of the Millennium Falcon. The model is a 1:1 replica of the 32" inch The Empire Strikes Back filming miniature. Kenner, Hasbro, Steel Tec, Master Replicas, Code 3 Collectibles and Micro Machines have all released Millennium Falcon toys and puzzles, including a Transformers version of the ship. Hot Wheels has made a model of the ship for their Star Wars starship line and a version of it as a car. It is also available as a Hot Wheels playset. Lego has released multiple versions of the Millennium Falcon in varying sizes. The 5,195-piece Lego model (part of the Star Wars "Ultimate Collectors Series") was physically the largest Lego set sold by the company, until it was topped in 2008 by the Lego Taj Mahal. In September 2017, Lego released an updated Millennium Falcon set in the Star Wars "Ultimate Collectors Series". With the new interior and more details compared to the 2007 model, the 7,541-piece model is the largest and most expensive commercially available Lego set. Lego has also made a version of the Falcon to tie in with the newest Star Wars movie, Solo. It is called the Kessel Run Millennium Falcon. ^ In the pre-release novelization, the line is: "less than twelve standard timeparts". ^ "Millennium Falcon Week Begins!". Lucasfilm. October 20, 2008. Archived from the original on October 21, 2008. Retrieved October 21, 2008. ^ Peterson, Lorne (November 14, 2006). Sculpting A Galaxy - Inside the Star Wars Model Shop. San Rafael, CA: Insight Editions. pp. 2–3. ISBN 1-933784-03-2. ^ a b c Bouzereau, Laurent (1997). Star Wars: The Annotated Screenplays. Ballantine Books. p. 53. ISBN 0345409817. ^ a b Rinzler, J. W. (September 1, 2010). The Sounds of Star Wars. Chronicle Books. p. 82. ISBN 978-0-8118-7546-2. ^ a b c d e Jones, Carwyn (February 26, 2015). "A long time ago... when Pembroke Dock made the Millennium Falcon". Retrieved December 22, 2016 – via www.bbc.co.uk. ^ a b c d "Welsh Memories of 'Millennium Falcon' - Pembroke Dock Heritage Centre". sunderlandtrust.com. September 11, 2014. Retrieved December 22, 2016. ^ "Towns secret Star Wars history". BBC. May 18, 2005. Retrieved May 12, 2010. ^ a b "The Last Corellian Shipyard". Lucasfilm. October 20, 2008. p. 5. Archived from the original on October 27, 2008. Retrieved October 21, 2008. ^ "The Last Corellian Shipyard". Lucasfilm. October 20, 2008. p. 2. Archived from the original on October 27, 2008. Retrieved October 21, 2008. ^ "Episode III Easter Egg Hunt". Lucasfilm. May 26, 2005. Archived from the original on April 1, 2011. Retrieved November 13, 2011. ^ "Millennium Falcon First Look In 'Star Wars: Episode VII' Is Worth Getting Excited About". MTV. June 3, 2014. Retrieved June 3, 2014. ^ Kastrenakes, Jacob (November 28, 2014). "Watch the first trailer for 'Star Wars: The Force Awakens'". Retrieved January 13, 2015. ^ "Star Wars: Databank: Millennium Falcon (Expanded Universe)". starwars.com. Retrieved June 27, 2007. ^ Szostak, Phil. The Art of Star Wars: The Last Jedi. Abrams Books. p. 94. ISBN 9781419727054. ^ Bacon, Thomas (May 25, 2018). "How and Why The Millennium Falcon Keeps Changing So Much". ScreenRant. Retrieved April 16, 2019. ^ "Star Wars (Public Version of Fourth Draft) on the Jedi Bendu Script Site". Retrieved December 7, 2014. ^ a b "George Lucas Was Backtracking Han Solo's "Parsec" Mistake In 1977". ScreenRant. March 1, 2019. Retrieved March 2, 2019. It's a very simple ship, very economical ship, although the modifications he made to it are rather extensive – mostly to the navigational system to get through hyperspace in the shortest possible distance (par-sect) [sic]. ^ Joss Whedon (2005). What's in a Firefly. ^ Patrizio, Andy. "Star Trek: First Contact - Special Collector's Edition". IGN. Retrieved October 31, 2008. ^ Sammon, Paul M. (June 1, 1996). Future Noir: The Making of Blade Runner. HarperCollins. p. 251. ISBN 978-0-06-105314-6. Bill George had been making a replica of the Millennium Falcon [ . . . ] we were so frantic to get more buildings into the cityscape that we grabbed Bill's ship, bristled it with etched brass, and plopped it into different shots. Instant building. ^ Aden, Jay. "Starship Troopers: A Studio Modeler Portfolio". Starship Modeler. Retrieved October 31, 2008. ^ "Berserk Millennium Falcon Arc ~Seimasenki no Sho~". MobyGames. Retrieved October 31, 2008. ^ The Emperor's Phone Call - Robot Chicken on Adult Swim. ^ "Star Wars x adidas Stan Smith – Millennium Falcon – Available". Sneaker News. Retrieved December 24, 2010. ^ "SpaceX Selected For Responsive space Launch Demonstration Under DARPA Falcon Program". October 20, 2004. Retrieved August 2, 2011. ^ "10 Star Wars Toys You Might Own That Are Now Worth a Fortune". Mental Floss. Retrieved February 7, 2018. ^ "Star Wars: Collecting: Till All Are One Millennium Falcon". starwars.com. March 2, 2006. Archived from the original on October 12, 2007. Retrieved June 28, 2007. ^ "The Falcon is Back and Better Than Ever". Lucasfilm. July 9, 2008. Archived from the original on October 11, 2008. Retrieved October 31, 2008. ^ "Steel Tec Millennium Falcon". Star Wars Collectors Archive. ^ "Millennium Falcon". Lucasfilm. October 22, 2008. p. 4. Retrieved October 31, 2008. ^ "HOT WHEELS® STAR WARS™ MILLENNIUM FALCON™ STARSHIP". Hot Wheels. ^ "Hot Wheels® Star Wars™ Millennium Falcon Carship Vehicle". Hot Wheels. Retrieved February 7, 2018. ^ "Hot Wheels Star Wars Millennium Falcon Playset". Amazon. Retrieved February 7, 2018. ^ Lipkowitz, Daniel (2009). The LEGO Book. DK. p. 144. ISBN 978-0-7566-5623-2. ^ "The new 7,541-piece Lego Millennium Falcon is the biggest and most expensive set ever". The Verge. ^ "The 10 Most Valuable Millennium Falcon Collectibles". Gemr. May 25, 2018.